The use of Ultraviolet light for disinfection of well and cistern water has become a popular, economical and safe alternative to traditional disinfection technologies. A UV system is a simple design, and in some models also provides filtration for the removal of sediment and chemical contaminants. Designed to provide disinfected water at a flow rate of 8-10 gallons per minute. Ideal for whole house water treatment. 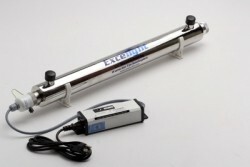 The most versatile commercial ultraviolet disinfection system on the market. This system is virtually unlimited in the possible filter configurations and manifold sequences. With it's capacity, versitility and cost, it is the world's most flexible and complete water disinfection system in its class. Designed to provide disinfected water at a flow rate of 7 - 20 gallons per minute. Ideal for whole house water treatment. This point of entry system is simple to operate and has a CSA approved ballast, lamp failure alarms(both audible & visual). Lamp change countdown clock and 7 day override feature. The 9000 hour rated UV lamp with 4 pin connector sits in a crystal quartz sleeve with silicone O-rings, and housed in a quality 304 stainless steel mirror-polished chamber. Each unit is equipped with the necessary hardware for installation. Requires a 5 micron prefilter with housing to complete. Retail price starts at $499.